Imagine descending below the surface of a clear mountain lake to explore a well-preserved wreck. Interested? Any time you scuba dive at an altitude higher than 300 metres/1000 feet above sea level, you’re an altitude diver. If you’re ready to discover a hidden world where few have ventured, then the Altitude Diver Specialty course is for you. Learning to adjust your dive plan for the reduced surface pressure at altitude is an important part of the course. *Course fee does not include any other snorkel or scuba equipment. Students must provide their own personal gear (masks, fins, snorkels, boots) which are available for purchase at the dive store and our friendly staff can professionally fit you for these items, if needed. 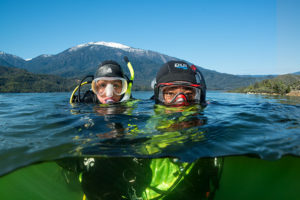 BC, Regulator with dive computer, and wetsuits are available to rent at a discounted daily rate for students enrolled in our Altitude Diver course. ** Students are responsible for providing their own transportation and personal items (swim suit, towel, etc). Cancellations or rescheduling require 48-hour notice. You may reschedule one time at no charge, after that any further adjustments will incur a $50 rescheduling fee per change. Cancellations are subject to a $75 cancellation fee.